This post brought to you by Whole Earth Sweetener Co.. The content and opinions expressed below are that of The Foodie Affair. 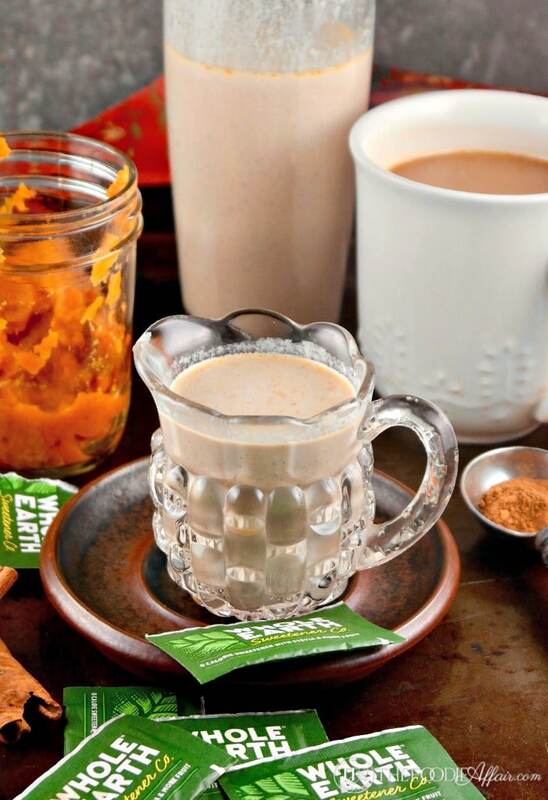 This is a lower sugar, homemade pumpkin spice coffee creamer sweetened with zero calorie Whole Earth Sweetener, Nature Sweet®, and simmered with milk, spices and pumpkin puree. Are you a morning person? Do you jump out of bed as soon as the alarm goes off and start whistling happy tunes? I wish I did, but I don’t. The alarm goes off and I pull the covers over my head lingering for at least 20 minutes longer than I should. You know what gets me out of bed? The smell of fresh brewed coffee! See, Alan is the kind of guy that pops out of bed and gets busy with a morning routine. He feeds all three of our needy little furry love bugs (Abby the canine, and Jem & Scout our felines), and makes coffee before hitting the shower. Fresh brewed coffee with homemade pumpkin spice coffee creamer is a great way to start the day! That bold smell of coffee that drifts throughout the house gets me motivated to grab a cup! After giving up the powdered creamers I always add a little heavy cream, but for the fall I thought I would make homemade pumpkin spice coffee creamer. I’m in love with the stuff and I have Alan hooked on it too. The best part of making your own flavored creamer is having complete control of the ingredients that go into the mix. If you’ve been following The Foodie Affair for awhile, then you know that I cut back on granulated sugar as often as I can, so when I was offered an opportunity to try Whole Earth Sweetener products with zero and lower calorie sweetener blends I couldn’t wait to start sampling. This isn’t the first time I’ve heard of Whole Earth Sweetener Company though. I noticed the Nature Sweet® packets at Starbucks near the condiment bar. Each packet has zero calories per serving and is made with a blend of monk fruit and stevia. The perfect amount of sweetness without any bitter aftertaste that stevia can leave on its own. 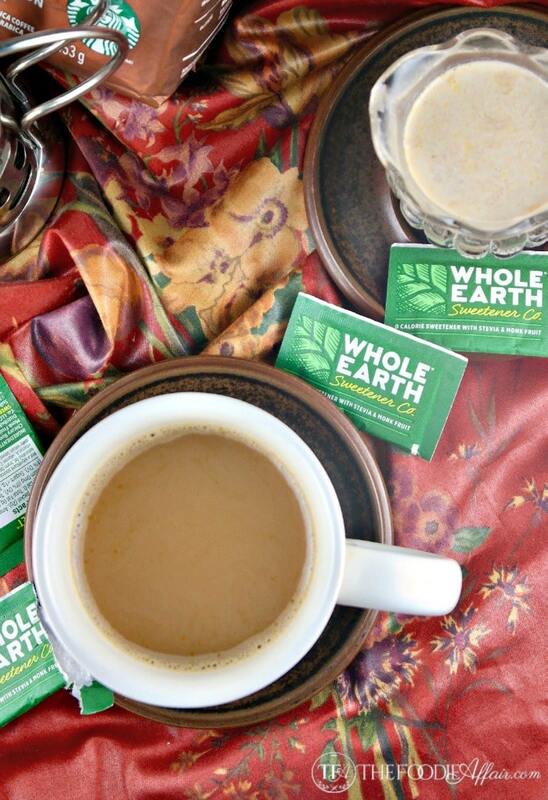 I sweetened the Pumpkin Spice Creamer with just four Nature Sweet® packets, which is perfect for Alan and me. The packets are convenient to use so feel free to add more sweetener to each cup of coffee if you would like. 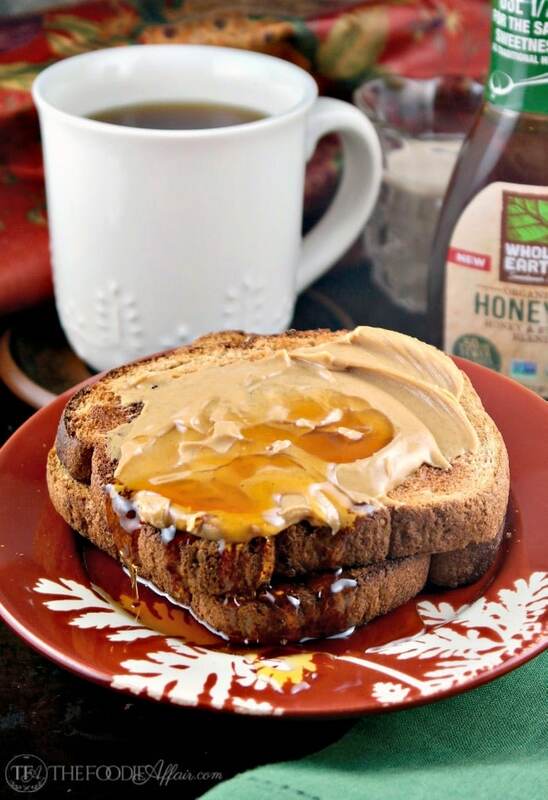 With your tasty coffee may I suggest adding Whole Earth Sweetener Honey 50 to toast with peanut butter? I found that you just need a little (half) as much for the same sweetness as traditional honey and it has 50% fewer calories than traditional honey. It’s also tastes delicious over plain Greek yogurt. In a small saucepan mix heavy cream, milk, Nature Sweet, Pumpkin pie spice, and pumpkin puree together. Add cinnamon sticks and simmer for 15-20 minutes. Pour through a sieve (optional) to remove thick pumpkin puree. Cool and store in a glass container. Keep in the refrigerator. This pumpkin spice creamer in my coffee would definitely make my mornings better! I love that it low in sugar, too! I’m definitely going to have to try this sweetner. Stevia does have a bitter taste to me. John loves to flavor his coffee but doesn’t want the extra calories of commercial creamers so I’m definitely going to have to make this! this is great – I need things to be lower sugar and I LOVE pumpkin spice (I mean who doesn’t right)? I’m going to look for the Whole Earth Sweetener! Perfect way to warm up on a chilly Fall day. 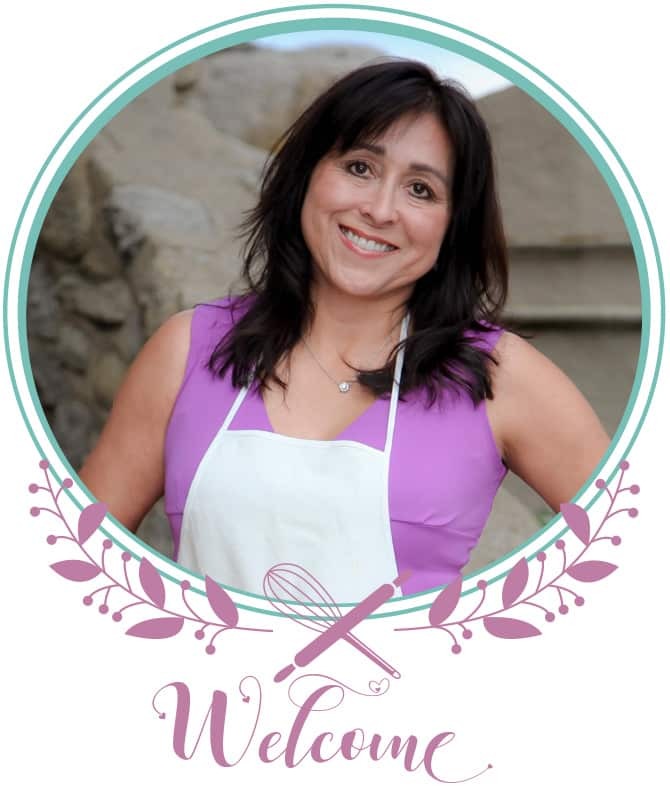 Love the idea of making my own coffee creamer! Thanks for this great recipe! I don’t usually use creamer because of the sugar – I so want to make this and use it year-round!! Love the creamer and the toast w/peanut butter and honey – fabulous! What a delicious treat!! great for an autumn morning! We ae huge fans of coffee creamer and try to use only those with low-sugar. 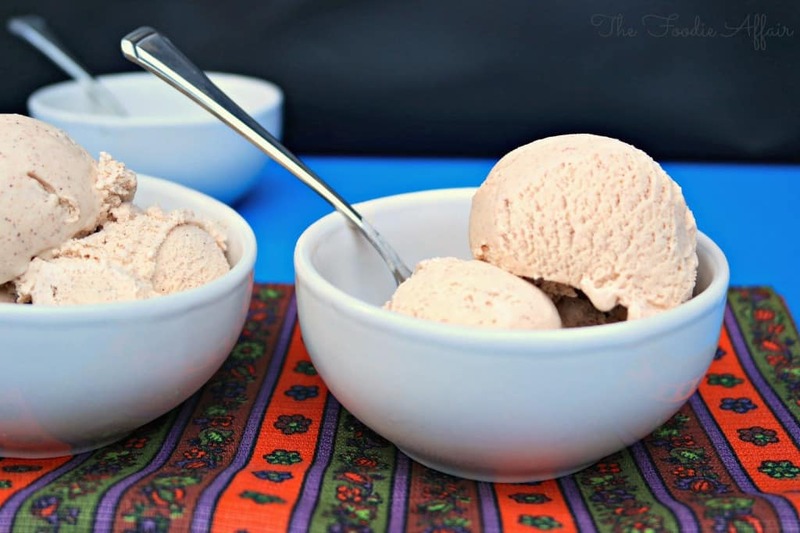 Pumpkin and pumpkin spice rank very highly on our list of most-loved fall flavors; can’t wait to try this one! I drink LOTS of coffee! And as a special treat I put creamer in sometimes. This is a great way to lower my sugar intake. Thanks for the info – I’ll keep an eye out for it. Oh, an that toast looks amazing! I love making my own creamers so I don’t have to shell out big bucks for those fancy coffees. Looks delicious! 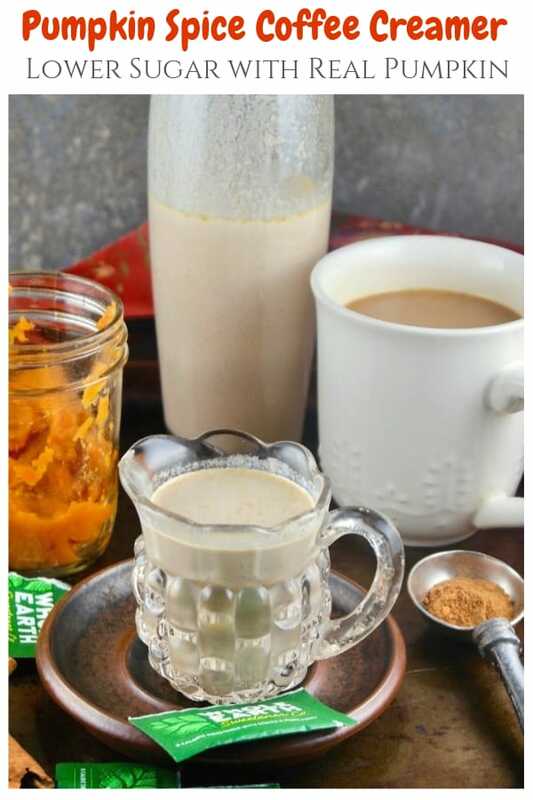 I never thought about making my own creamer…this sounds wonderful! Pumpkin spice creamer is one of the few I love, but I don’t usually treat myself. I love that this is lower in sugar and calories! Thank you! When I switched over to unsweet tea I still choose to drink my hot chocolate with lots of marshmallows! 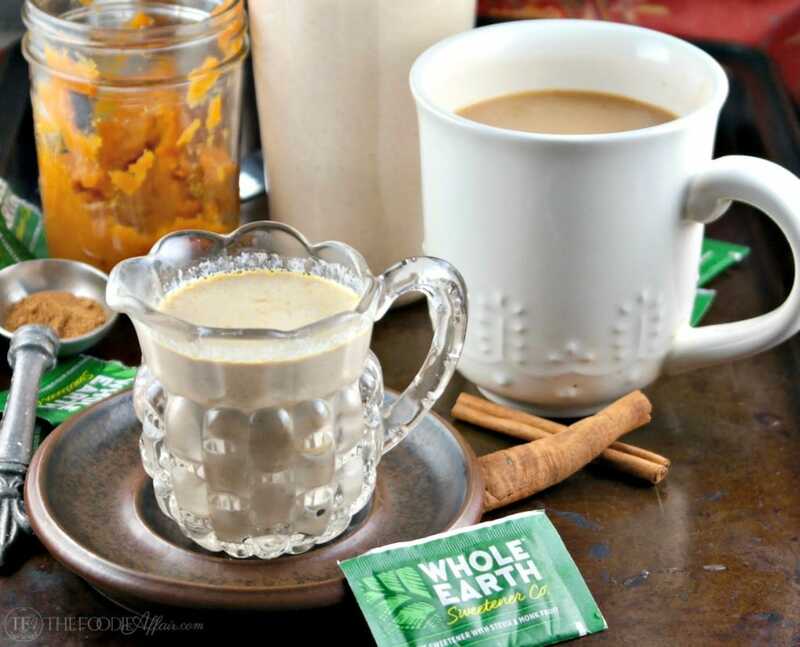 This pumpkin spice creamer is awesome with less sugar and I can still get my drink on!! These sugar substitute packets sound interesting. A blend of monk fruit and stevia – should be delicious and not bad for you like some of those packets. Your creamer sounds like the perfect way to spice up the morning. I am typically a black coffee drinker — that is until I can use pumpkin spice!! Now I can made it at home!! Thanks! This is a dream come true! Creamer without sugar and packed with fall and pumpkin flavors. Yes please!! I’m avoiding sugar these days, too, so this creamer would be a perfect treat to add to may coffee! Homemade coffee creamer is a fantastic idea! I love that it’s lower sugar! I am not a coffee drinker but when it gets cold I like to drink mochas like grown-up hot cocoa! I will definitely love to try this creamer to make a new drink for me to enjoy! All of your pumpkin recipes are delicious.- thanks for this one!